Ever wondered why with dole queues at their highest levels since 1996, in many areas pubs and restuarants are heaving, the West End theatres full and motorways crowded with traffic? The answer is provided in an extraordinary analysis by the House of Commons Library of the latest claimant figures released by the government (see http://bit.ly/x6wWxw). Far from the picture painted by David Cameron’s infamous slogan ” We are in it together” the United Kingdom is as divided over who is on the dole and who isn’t as it is over bankers’ bonuses and public sector worker pay freezes. And it is not just the differences between the disproportionate numbers of young people-under 24- on the dole and an older generation in work. It is the fact that across the nation the number of people claiming job seekers’ allowance is now dividing area against area and becoming party political. Put it simply the government – whether it intended to or not – is dumping on areas that voted Labour and leaving many coalition seats- Liberal Democrat and Conservative alike – completely unscathed from the grim dole reaper. In fact -taken year on year in some Tory and Lib Dem seats unemployment claims are, believe it or not, actually FALLING. Am I making this up? No it is all in the report. The Commons library report looks at dole claimants and breaks them down by constituency -taking as its base the economically active – those aged between 16 and 64 – and working out how many people in the constituency are unemployed. It then ranks them all. The top 15 dole constituencies-with the exception of three- are all Labour seats. And the other three are in Northern Ireland. The bottom 15 are all Conservative or Liberal Democrat. And the difference is stark . In Labour held Birmingham,Ladywood, – the Number One seat for dole claims- more than one in five people are claiming. In Liberal Democrat held West Aberdeenshire and Kincardine, the figure is 1 in 100 and falling for the long term unemployed. Among prominent politicians John Redwood and David Cameron both have miniscule numbers on the dole- and the overall jobless claims are falling in Redwood’sconstituency despite a rise in youth unemployment. While Liam Byrne, the shadow works and pension secretary, and ex union leader Jack Dromey have some of the highest. There is more on this in an article by me and Rajeev Syal on the Guardian Society website (see http://bit.ly/xvUv8M ) and by me in Tribune (http://bit.ly/z3dAhM). Perhaps it can be best illustrated by comparing Liam Byrne constituency with Chris Grayling, the Secretary of State for Works and Pensions. Liam Byrne’s Birmingham Hodge Hill seat has the second highest number of dole claimants in the UK with 7257 claiming benefits – 1750 for over a year – and a rise of 723 – 250 on the long term register. Chris Grayling in Epsom and Ewell has 1007 on the dole – an increase of 44 in a year – with a rise of just 5 people out of work for a year -to just 135. No wonder perhaps the dole queues do not have the same resonance for the Tories as Labour. Tory Mps’ surgeries are hardly going to be packed with desperate people looking for jobs – but Labour Mps are going to be overwhelmed. It also has a political impact and might be one reason why Labour is not capitalising on the recession- simply because in some areas it does not exist. The most interesting point is that Lord Young’s much criticised statement about people never having it so good – is actually true in some Tory areas. 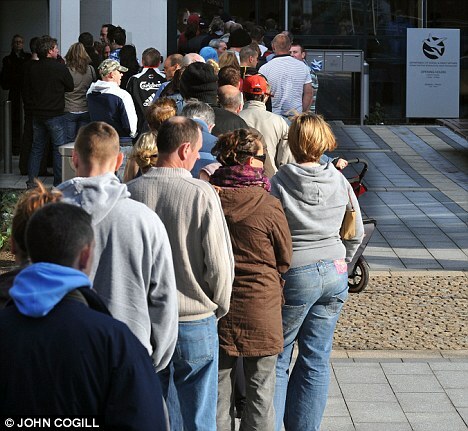 Labour is going to have try much harder to get the point of the horror of the dole queues across to a wider general public – because as it stands the Tories seem to have manipulated a recession that concentrates almost entirelyon their constituencies and affects mainly their voters. This entry was posted in Uncategorized, Whitehall and tagged chris grayling, dole queues, liam byrne, unemployment. Bookmark the permalink. No, the government is not dumping on Labour areas – simply levelling out the playing field which saw Labour pour billions – to no apparent effect – into these areas. How exactly is the government ‘dumping’ on Labour areas? And have you thought that cause and effect are the other way around, that people out of work vote Labour to protect their benefits?